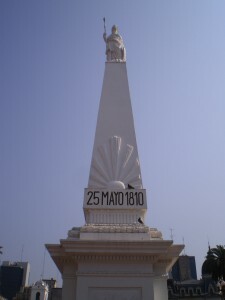 In 1536 explorer Pedro de Mendoza, stopped for a while, put a few tents up and Buenos Aires was born. Originally called Ciudad de Nuestra Señora Santa María del Buen Ayre it didn’t last long and by 1541 was gone. In 1580 however, another explorer Juan de Garay decided he liked the spot and set up a permanent settlement named Santísima Trinidad, the port however kept the previous name, Puerto de Santa María de los Buenos Aires. This was to prove to be the most important part of the city – to this day the inhabitants of Buenos Aires are known as Porteños, people of the port. Throughout the 17th and 18th centuries, the port of Buenos Aires played a pivotal role in the Spanish colonisation of South America. Following the French Revolution in 1789, unhappiness with the colonial rule led, in 1810 to the May Revolution (commemorated today in the Plaza de Mayo), and on 9th July 1816 to full independence for Argentina. Throughout the 19th century, there were squabbles as to the status of Buenos Aires within this new nation but by 1880 the Federal Capital was established, and its role as the seat of government fixed. As a major port, Buenos Aires flourished economically and culturally and by the start of the 20th Century it ranked with the major European cities of the age, having remodeled itself with wide avenues, leafy boulevards, grand mansions, one of the finest opera houses in the world and South America’s first underground train system. The 1920s brought a large wave of immigration to Argentina from Europe, mainly Italy and Spain, the influences of which are still very strongly felt today in Buenos Aires and Argentina as a whole. Plaza de Mayo (& the Casa Rosada which houses the President’s Offices) has been the focal point for many demonstrations throughout the second half of the Twentieth Century. In 1955, 364 people (mainly civilians) died when Plaza de Mayo was attacked by 34 Argentine Navy planes in a coup against the then-President Juan Perón. Today, it is where the Madres de la Plaza de Mayo march every Thursday in memory of the 30,000 people killed during the military dictatorship of the late 1970s and early 1980s. Today Buenos Aires and surrounding urban area is home to over 12 million people, a third of the population of Argentina, making it the 2nd largest city in South America after Sao Paulo in Brazil. The European influence remains strong (over 85% of the population are of European descent), yet it is a city which is proud of its place in South American history.